A black clad shadowy figure skulks across a rooftop. His footsteps are silent as his movement is fluid. He launches two throwing stars which catch in the throats of two guards. He lowers himself into the courtyard and dispatches an unwitting Samurai with as little as a glint of a blade. The guards spot the assassin who tosses a smoke grenade to the floor. Seemingly disappearing into thin air. This is the Ninja of pop culture. Mysterious, stealthy professional assassins who possess almost magical skills and weapons. They are very interesting, proved by their status as popular culture icons. But what is the true nature of these legendary Japanese warriors? First it is important to understand the origin of the Ninja. First off; the 'correct' term for them is Shinobi, the underlying connotation of which means “To steal away”. Japanese folklore suggests that the ninja descended from a half-man half-crow demon, but it is far more likely that the Ninja evolved as the 'water' to the Samurai's 'fire'. It is difficult to pinpoint the exact moment at which the Shinobi began to exist, considering that espionage has been used in practically every war in history and is typically not very well documented. However, it was not until the 15th Century that spies were specifically trained for that purpose, and at around this time the word Shinobi began to appear to describe these stealthy and secretive agents. However, the Ninja could not have simply appeared out of nowhere. Rather, they evolved over the course of the chaotic era between 1340 and 1600. During this period of almost constant war and struggle, the skills that the Shinobi brought to the conflict would prove invaluable – just as is espionage in any conflict, ancient or modern. The Ninja families were organised into larger guilds, whose members also had ranks. For example, a Jonin (Upper Man) was the highest rank, and their duty was to represent the group and hire out the Shinobi. The next rank is the Chunin (Middle Man), who were assistants to the Jonin. At the bottom of the rank structure was the Genin (Lower Man), who were field agents who were assigned and hired to carry out missions. One common misperception is that the Ninja were all men, however women also served as Shinobi just as they also did as Samurai. Female ninja, or Kunoichi, often infiltrated enemy castles in the guise of dancers, concubines or servants. Speaking of Ninja families and clans. The Iga and Kōga clans have come to describe the Shinobi families living in the Provinces Iga and Kōga. It is in these regions that villages devoted to training Ninjas first began to appear. Probably in part due to the area's remoteness and inaccessibility of the surrounding mountains aiding their secretive development. The Daimyo Oda Nobunaga would later invade the region in order to wipe out these organised groups. The Samurai in Japan follow the Bushido code and thus value loyalty, valour and honour above all else. In a conflict a Samurai would typically fight by selecting an opponent, announcing a challenge, listing his family pedigree and only then attack. Their armour was adorned in bright colours to show off their clan identity. The Bushido code was noble in it's ideals, but in war the Daimyo knew it could not always get the appropriate job done. This is where the Shinobi code of Ninjutsu came in. The Ninjutsu values accomplishing a goal by any means necessary; be it sneak attacks, backstabbing, poison and seduction – but these are all things that would be seen as shameful to a Samurai. It was a win-win situation for both parties; the Samurai could hire the Shinobi to do their dirty work without sullying their honour, and the lower classes (as the Samurai were the upper classes in Feudal Japan) benefited from a transfer of wealth as the Ninja were handsomely paid for their delicate line of work. It is widely suggested that Ninjutsu began as a blend of Chinese and native tactics, slowly developed as the counter-culture to Bushido, but it was likely first formalised by Daisuke Togakure and Kain Doshi. Daisuke was a Samurai, but had been on the losing side in a regional battle. Thus, because his honour was disgraced in defeat he lost his lands and prestigious Samurai title. In around 1162 it is said that Daisuke was wandering the mountains southwest of Honshu when he met a man called Kain Doshi, a Chinese warrior-monk, who taught him the art of survival and this new philosophy on life. Daisuke renounced the Bushido code and together the two developed this new theory of guerilla warfare, known as Ninjutsu. Daisuke's descendants created the first Ninja 'Ryū' (School). From there Ninjutsu developed in such a way that many different 'Ryū' appeared, and thus various differentiating versions of Ninjutsu appeared, each with their own focus or specialisation. The Ninja evolved to suit a need on the Japanese battlefield during the various set of conflicts and wars that ravaged the country for centuries. Following is a brief overview of some of these struggles. For more than 50 years in the 14th century, Japan had two separate imperial courts, which fought for control of the country. The Northern Court was controlled by the shoguns. The Southern Court belonged to Emperor Go-Daigo, who wanted to rule in his own right. Ninja played an important role on both sides in this struggle, infiltrating castles as spies, and even burning down the South's Hachiman-yama Fortress. The Northern Court eventually won, and the puppet-Emperor system was retained. About 70 years later, the Onin War broke out. Ninja featured heavily in this conflict, as well. The war began as a succession fight within the ruling Ashikaga clan, but soon devolved into a nation-wide civil war. Although the Onin War ended after 10 years, it ushered in a century of turmoil called the Sengoku Jidai, or "Warring States Period" (though it was actually samurai clans fighting, rather than states). Ninja served a number of purposes during the Sengoku Period (1467-1568). They acted as kancho (spies), koran (agitators), teisatsu (scouts), and kisho (surprise attackers). They were most effective in castle sieges, infiltrating and distracting the defenders inside while the main besieging army attacked from outside. The ninja were an important tool during the Sengoku Period, but a destabilizing influence. When war-lord Oda Nobunaga emerged as the strongest daimyo and began to reunite Japan (1551-1582), he saw the ninja strongholds at Iga and Kōga as a threat. Nobunaga's lightning-quick attack on Iga forced the ninja to fight open battles; they were defeated and scattered to nearby provinces or the mountains of Kii. While their power-base was destroyed, the ninja did not vanish entirely. Some went into the service of Tokugawa Ieyasu, who later became shogun in 1603. The much-reduced ninja continued to serve both sides in struggles. In one famous incident from 1600, a ninja sneaked through a group of Tokugawa's defenders at Hataya castle, and planted the flag of the besieging army high on the front gate. We know that through their 'Fire and water' relationship with the Samurai that they were respected, mistrusted and feared all at once. Some Samurai feared the Shinobi so much that they would install a series of countermeasures to prevent their activities. Precautions taken could include concealed weapons beneath floorboards and traps attached to bells in order to raise alarm of intruders. Japanese Castles were also designed to be mazes which were difficult to navigate; blind spots and holes in the walls would allow surveillance of the castle grounds. Other devices such as 'Nightingale' floors - which rested on metal hinges specially designed to squeak when walked over, ground covered in gravel and segregated buildings to better contain fires. 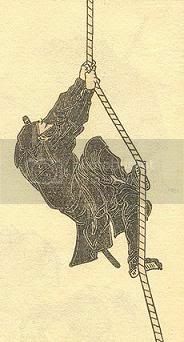 The Edo Period (1603-1868) brought stability and peace to Japan, bringing the ninja story to a close. Ninja skills and legends survived, though, and were embellished to enliven the movies, games and comic books of today and thus began our Pop Culture obsession. The real Shinobi of course are different to the stereotypical depiction of a Ninja. For example, the Shinobi are usually shown wearing black from head to toe, but infact this costume is from Japanese Kabuki theatre. Actual Ninjas wore navy blue for night time operations, but it was far more common for them to dress or wear disguised in such a way to blend in with their targets, just as any other espionage agent would. I thought the origins of ninjas where just peasents and farmers and the like, who stood no chance in a fair fight with a samurai. So, like you said, they don't fight fair and used tricks. The guards spot the assassin who tosses a smoke grenade to the floor. Seemingly disappearing into thin air. What do you mean by this? they had things called black eggs that were hollowed out eggs that the ninja had filled with anything he had at hand. Such as broken glass and the like, they even had a thing that was like the first pepper spray, but I'm not sure if they actually used pepper essense or anything, it was just something that would sting the eyes, or they would even just use dirt. They would crush it in their hand and throw it in the eyes of the atacker, blinding him temporarily (Except maybe with the glass it wasn't temporary) thus comes the dissapearing in a puff of smoke saying. Oh, and I think the actual name for the throwing stars is Shuriken. Well that first part is me trying to describe the Pop Culture Ninja... the article then goes on in contrast to that interpretation. And yeah they were typically of poorer folk and infact there are records of their weapons being modified farming tools, but that does not mean they were untrained...hence Ninjutsu. But as the article states, fighting was hardly their primary role. Yes, they did train and stuff. Detailed and informative, yet brief and easy to read. If you are looking to lengthen the article, or write a second one about these, you could add in tidbits about their weapons (ninja-to, shuriken, rope, etc) and possibly a bit about how they may be employed in the game. Yeah, originally I was going to jam it all in the one article. But the vast list of tools and weapons I found made it hard to compact, so at some point I do intend to write a little more on Ninja Tactics.